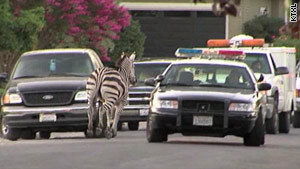 Police pursue an escaped zebra on the streets of Sacramento, California, on Saturday. (CNN) -- Two zebras are in custody after making a run for it Saturday evening through the streets of Sacramento, California, authorities said. The zebras were on the loose in the Carmichael area after escaping from their owner's home, where they are kept as pets, said Sgt. Tim Curran, a spokesman for Sacramento County Sheriff's Department. Authorities have corralled one zebra at an apartment complex. The other one suffered injuries and will be seen by a veterinarian before going home.